In 1998, Julia Miller began the monumental task of sifting through notes and observations made during her 30 year career as an archivist and book conservator. After 8 years of additional research, she began to write. The publication that resulted, Books Will Speak Plain, (The Legacy Press 2010) is 500-page handbook aimed at conservators, collectors, librarians, and book lovers, for the identification and description of book structures and styles. 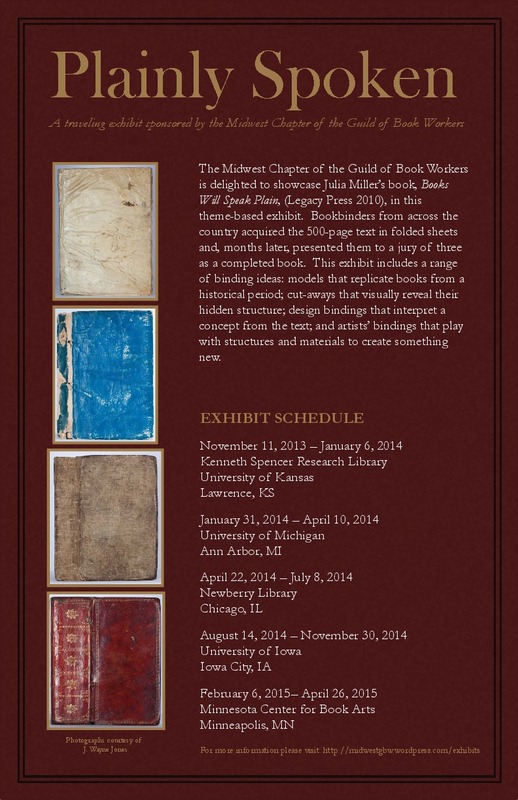 The Midwest Chapter of the Guild of Book Workers is delighted to showcase Miller’s book in this theme-based exhibit. Bookbinders from across the country acquired the text in folded sheets and, months later, presented them to a jury of three as a completed book. This exhibit includes a range of binding ideas: models that replicate books from an historical period; cut-aways that visually reveal their hidden structure; design bindings that interpret a concept from the text; and artists’ bindings that play with structures and materials to create something new. Special thanks to Julia Miller for providing the book world with such an important text and for her support of the exhibit; to Whitney Baker for playing such a pivotal role in the exhibit’s beginning; to the three jurors: Richard Baker, Brea Black, and Linda Samson-Talleur, who generously gave their time and expertise in selecting such wonderful bindings; to each institution hosting the exhibit; and to the exhibit committee who made it all possible and Mary Uthuppuru, and Midwest Chapter exhibits coordinator. All exhibit photos by Travis Young, KU Libraries Digital Lab.